Double the Emmy nominations at home, double the love on the red carpet! Jessica Biel earned her first Emmy nod on Thursday, for Best Lead Actress in a Limited Series or Movie for her role in The Sinner, while the production of the Super Bowl LII Halftime Show, which featured her husband Justin Timberlake as the performer, earned four Emmy nominations, including Best Directing for a Variety Special. John Legend and wife Chrissy Teigen could also both celebrate Emmy wins at the 2018 awards; he is nominated for his first Emmy for Best Lead Actor in a Limited Series or Movie for his title role in NBC's Jesus Christ Superstar Live in Concert, his first major acting performance, while Lip Sync Battle, which features Teigen as a presenter, is nominated for Best Structured Reality Program for the third year in a row. If Legend wins an Emmy, he will become the 13th person to achieve EGOT status. In addition, the FX series The Americans is nominated for four Emmys and its leading stars and real-life couple Keri Russell and Matthew Rhys received individual nods. The two were also nominated for their roles last year and in 2016. Also, Jimmy Kimmel Live! is nominated for the Emmy for Outstanding Variety Talk Series for the seventh year in a row. If the show wins, Jimmy Kimmel will share the award with several co-producers, including his wife Molly McNearney, who is also his head writer. 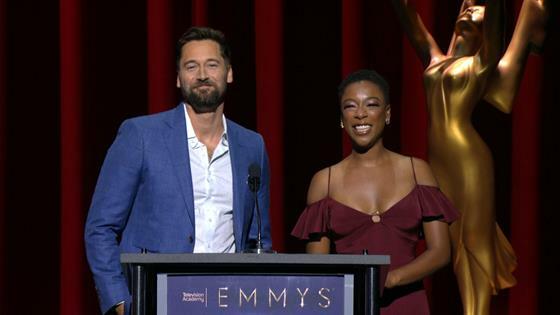 The 2018 Emmys will be broadcast live on NBC on September 17.